Heiko Milz, owner and head coach at Magic Goalies will deliver a GK specific camp for players looking to develop top level GK skills. If you are a club goalkeeper wanting to reach the next level then this camp is for you. Heiko brings a wealth of knowledge, expertise and experience. 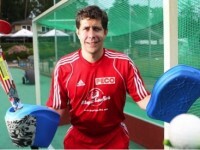 Heiko played top level bundesliga hockey for Club an der Alster-Gladbacher HTC in Hamburg German. Heiko has developed Gk’s that have gone onto represent Germany’s Men and Women’s National Teams. Registration is now closed open for our Evening Summer Camp in June.